Whether browsing in the time vacuum of Powell's City of Books or simply people watching to brush up on the new and exciting ways you can pierce your body, enjoying downtown Portland works up an appetite. And in a city that does indeed have its share of Starbucks and Chipotles, there are a few oases of culinary innovation and variety: food cart pods. Whether or not Portland invented the current food truck craze is up for debate, but for 30 years—long before your friend had his killer idea for an Asian fusion grilled cheese truck—at the corner of Southwest 5th Avenue and Stark street, tiny trailers and huts have been slinging affordable cuisine from around the globe in one tiny parking lot. 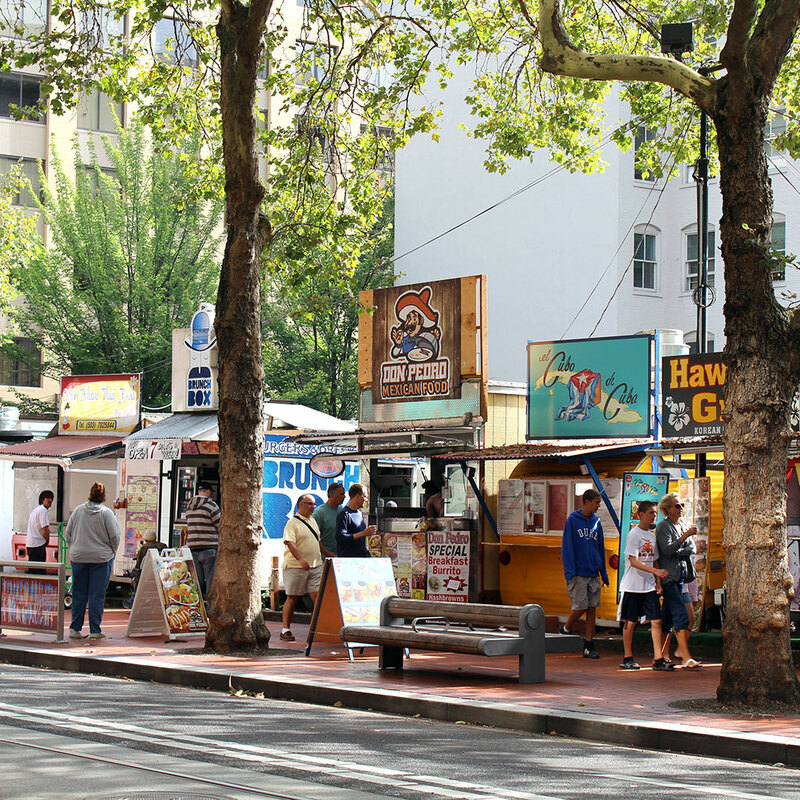 As food culture has expanded in the past few decades, so too have the city's pods of food carts. But as WIllamette Week reports, these integral threads of Portland's unique fabric are now in danger. Three of the pods have recently been put on the Downtown Development Group's list of properties that they intend to develop. The pods are, essentially, parking lots where vendors can park year round without moving their cart and pay monthly rent. This is perfect for folks who like to make food, but can't afford the overhead of a brick and mortar restaurant. But to commercial developers, those flat parcels of land earning (what they consider) a paltry tens-of-thousands of dollars per month in revenue are wasted opportunities. Their plan is to build commercial and residential high-rises and in doing do, effectively boot out these long-term but low-earning food vendors from the area. However this may not be a cut and dry case of capitalist pirates laying siege to innocent, hardworking people. It is Portland, after all. The people there are super nice (my parents included). Greg Goodman, co-president of the development group claims that the carts are welcome to move to some of the other less-pressingly needed lots his group owns. He's even offered to fund upgrades to add updated electrical capacity so even more carts could operate. But if the idea of lying in bed with the enemy isn't palatable, the cart owners might also consider striking up a deal with city parks as the expansion of the weekly Saturday Market has done. In the end, with a growing interest in Portland as a place to live and travel, it's an important conversation for that city (any city, really) to have. Just how much profit are we willing to sacrifice for our identity? As it stands, the development plans are in the very early design stages, so there's is still plenty of time for the cart owners and developers to find a solution on how best to keep Portland the way so many of us like and expect it to be.